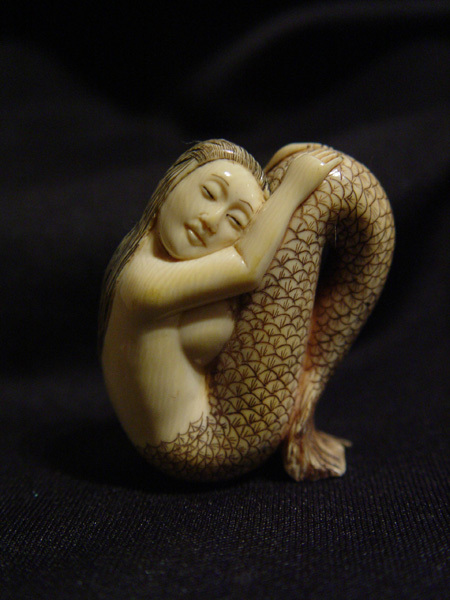 Japanese artists starting in the 17th century cleverly invented the miniature sculptures known as netsuke (Japanese:??) to serve a very practical function. (The two Japanese characters ne+tsuke mean “root” and “to suspend or hang” in reference to the roots and twigs used as toggles before carved netsuke were produced.) Traditional Japanese garments – robes called kosode and kimono – had no pockets. Men who wore them needed a place to keep personal belongings such as pipes, tobacco, money, seals, or medicines. The elegant solution was to place such objects in containers (called sagemono) hung by cords from the robes’ sash (obi). The containers might take the form of a pouch or a small woven basket, but the most popular were beautifully crafted boxes (inro), which were held shut by ojime, sliding beads on cords. Whatever the form of the container, the fastener that secured its cord at the top of the sash was a carved, button-like toggle called a netsuke. Such objects, often of great artistic merit, have a long history reflecting important aspects of Japanese folklore and life. Netsuke production was most popular during the Edo period in Japan, around 1615-1868. Today, the art lives on and carvers, a few of whose modern works command high prices (US$10,000 to $100,000, or more), are in the UK, Europe, the USA, Japan and elsewhere. Prices at auctions in the USA for collectible netsuke typically range from a few hundred dollars to a few thousand. Inexpensive molded, faithful reproductions are available in museum shops and elsewhere for $30, or less. -kagamibuta – shaped like a manju, but with a metal disc serving as lid to a shallow bowl, usually of ivory. The metal is often highly decorated with a wide variety of metallurgical techniques.